KIGALI, Apr 6 2014 (IPS) - Joane Nkuliye considers herself an activist. 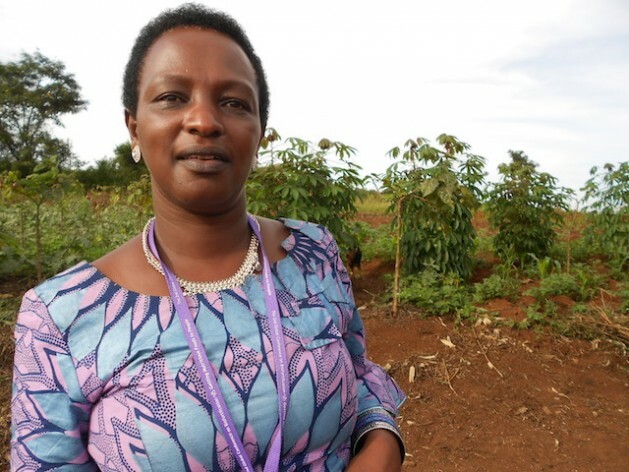 She is part of a select group of farmers producing biofortified crops on a commercial scale in Rwanda. Nkuliye owns 25 hectares in Nyagatare district, Eastern Province, two hours away from the capital, Kigali. She was awarded land by the government and moved there in 2000, with plans of rearing cattle. But she soon realised that growing food would be more profitable and have a greater impact on the local community as many of the kids in the area suffered from Kwashiorkor, a type of malnutrition caused by lack of protein. “I have a passion for farming. We are being subsidised because very few people are doing commercial farming,” the entrepreneur, who is married with five children and has been farming for over 10 years, told IPS. Every second person in the world dies from malnutrition. In order to fight the so-called hidden hunger — a chronic lack of vitamins and minerals — biofortification aims to increase nutrition and yields simultaneously. HarvestPlus is part of the CGIAR Consortium research programme on Agriculture for Nutrition and Health (A4NH), which helps realise the potential of agricultural development to deliver gender-equitable health and nutritional benefits to the poor. The HarvestPlus programme is coordinated by the International Centre for Tropical Agriculture and the International Food Policy Research Institute. It has nine target countries: Nigeria, Zambia, Democratic Republic of Congo, Rwanda, Uganda, Ethiopia, Bangladesh, India and Pakistan. Brazil has also begun introducing biofortified crops. The director of HarvestPlus, Howarth Bouis, told IPS that the goal was to reach 15 million households worldwide by 2018 and ensure that they were growing and eating biofortified crops such as cassava, maize, orange sweet potato, pearl millet, pumpkin and beans. “It is always a challenge but it’s much easier than it was before, because we have the crops already. Years ago I had to say we wouldn’t have [made an] impact in less than 10 years. Now things are coming out and it has been easier to raise money,” Bouis said. Four years ago, she was contacted by the NGO HarvestPlus, which is part of a CGIAR Consortium research programme on Agriculture for Nutrition and Health. The NGO is considered a leader in the global effort to improve nutrition and public health by developing crops and distributing seeds of staple foods that are rich in vitamins and minerals. HarvestPlus provided Nkuliye with seeds, packaging, outlets for distribution and know-how. Now she grows biofortified beans on 11 of her 50 hectares of land. “After harvesting beans I grow maize as an intercrop. I also grow sweet bananas, pineapples and papaya. I harvest 15 tonnes of food; I talk in terms of tonnes and not kilos,” she smiled. Nkuliye was invited by HarvestPlus to speak at the Second Global Conference on Biofortification held in Kigali from Mar. 31 to Apr. 2, which was a gathering of scientists, policymakers and stakeholders. Rwanda has ventured into a new agricultural era as it boosts its food production and enhances the nutrition level of the crops grown here. In this Central African nation where 44 percent of the country’s 12 million people suffer from malnutrition and micronutrient deficiency, biofortified foods, like beans, are seen as a solution to reducing “hidden hunger” — a chronic lack of vitamins and minerals. One in every three Rwandans is anaemic, and this percentage is higher in women and children. An estimated 38 percent of children under five and 17 percent of women suffer from iron deficiency here. This, according to Lister Tiwirai Katsvairo, the HarvestPlus country manager for the biofortification project, is high compared to other countries in sub-Saharan Africa. Biofortified beans have high nutritional levels and provide up to 45 percent of daily iron needs, which is 14 percent more than commonly-grown bean varieties. They also have an extra advantage as they have proved to produce high yields, are resistant to viruses, and are heat and drought tolerant. Now, one third of Rwanda’s 1.9 million households grow and consume nutritious crops thanks to an initiative promoted by HarvestPlus in collaboration with the Rwandan government. The HarvestPlus strategy is “feeding the brain to make a difference,” Katsvairo said. The national government, which has been working in partnership with HarvestPlus since 2010, sees nutrition as a serious concern. According to Rwanda’s Minister of Agriculture and Animal Resources Agnes Kalibata, five government ministers are working cooperatively to address nutrition issues here. She said that biofortified crops ensured that poor people, smallholder farmers and their families received nutrients in their diets. Around 80 percent of Rwanda’s rural population rely on agriculture for their livelihoods. “Beans in Rwanda are our staple food, they are traditional. You cannot eat a meal without them. Beans that are biofortified have the main protein that will reach everybody, they are the main source of food,” she said. Katsvairo explained that Rwanda has 10 different varieties of biofortified beans and that Rwandan diets comprise 200 grams of beans per person a day. “Our farmers and population cannot afford meat on a daily basis. In a situation like this we need to find a crop that can provide nutrients and is acceptable to the community. We don’t want to change diets,” Katsvairo told IPS. The ideologist and geneticist who led the Green Revolution in India is an advocate of what he calls “biohappiness”. Mankombu Sambasivan Swaminathan became famous for the Green Revolution that increased food production and turned India into a sustainable food producer. “I am an enthusiast of biofortification. It is the best way to add nutrients like iron, zinc and vitamin A. In the case of biofortification it is a win-win situation,” he told IPS. According to Swaminathan, who has been described by the United Nations Environment Programme as “the Father of Economic Ecology”, the concept of food security has grown and evolved into nutritious security. Swaminathan says it is also a way of attacking silent hunger — hunger caused by extreme poverty. “It fortifies in a biological matter and not in chemical matter, that is why I call it biohappiness,” said the first winner of the World Food Prize in 1987. He has also been acclaimed by TIME magazine as one of the 20 most influential Asians of the 20th century. According to Katsvairo, Rwanda has become an example to other sub-Saharan countries as the issue of nutrition is now part of public strategic policy here. “Rwanda is still at the implementation stage but it is way ahead of other African countries,” confirmed Katsvairo. Meanwhile, Nkuliye aims to expand her farm over the next few years and increase her crop of biofortified beans. “I wanted to improve people’s lives. My husband is proud of me but I feel I haven’t done enough yet,” she said. Currently, she employes 20 women and 10 men on a permanent basis and hires temporary workers during planting and harvesting. She first started her business with a three-year bank loan of five million Rwandan Francs (7,700 dollars). Now, she has applied for 20 million Rwandan Francs (30,800 dollars). “I want to buy more land, at least 100 hectares. What I am producing is not enough for the market,” Nkuliye explained. While she harvests tonnes of produce to sell to the local market, she says it is not enough as demand is growing. But she is proud that she has been able to feed her community. “I have fed people with nutritious beans, I changed their lives and I have also changed mine. We have a culture of sharing meals and give our workers eight kilos of biofortified food to take to their families,” she said. Fabíola Ortiz was invited by HarvestPlus and Embrapa-Brazil to travel to Rwanda.